Tahir Shah has a point there… The problem with the short flight from the UK to Marrakech is the lack of time to prepare yourself for the experience. I have travelled a lot and after reading about the souks of Marrakech felt more than ready to face them with a smile on my face and a spring in my step. I was excited about the photography but also about the experience of the city. I looked forward to wandering around in a bohemian fashion between street sellers and entertainers in Jamaa el Fna and I eagerly anticipated strolling past stalls of spices towering high. All of these experiences awaited me but alongside them came a host of other surprises, ones which I wish I had given more time to. More time to absorb all that this city has to offer. 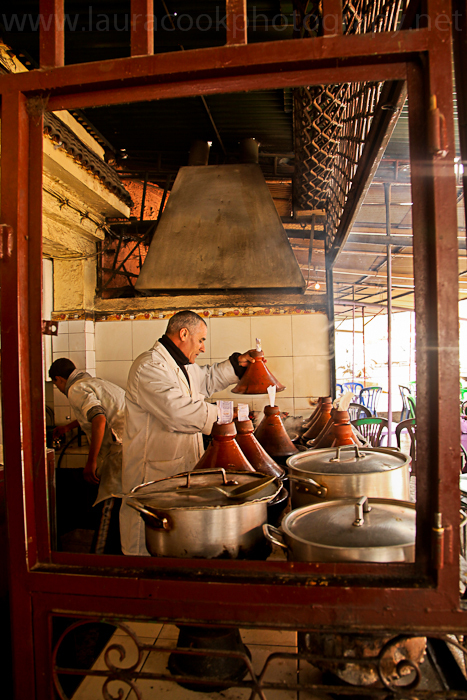 A weekend in Marrakech is not long enough but at the same time is more than enough. 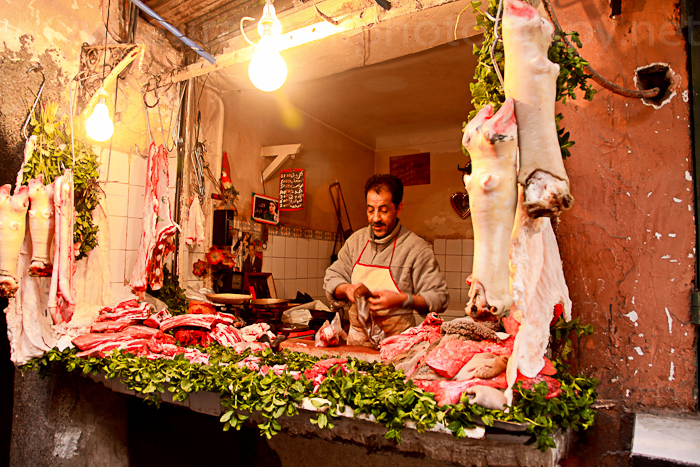 I found Marrakech a wonderful, interesting, tiring and confusing city. After three days there I had only just begun to get a sense of the place and yet less than a week later I look back at a blur of colour and scents with little understanding of what I saw. I felt invigorated by a weekend away with my husband exploring and at the same time tired from the constant street banter and sales patter. Butcher working by the light of some brightly strung bulbs. 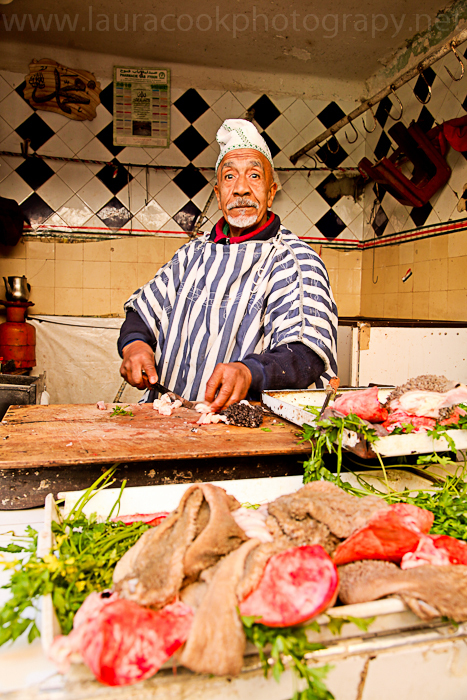 A serious butcher cuts meat ready for the constant stream of customers in the souk. 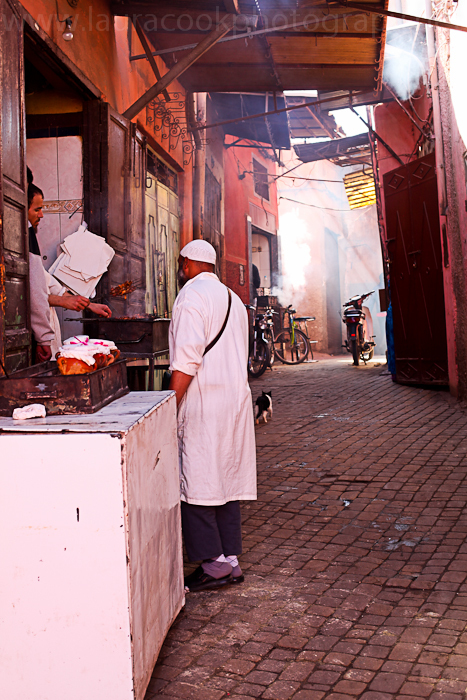 Many locals stop to chat at the various stalls and food shops around the souks. 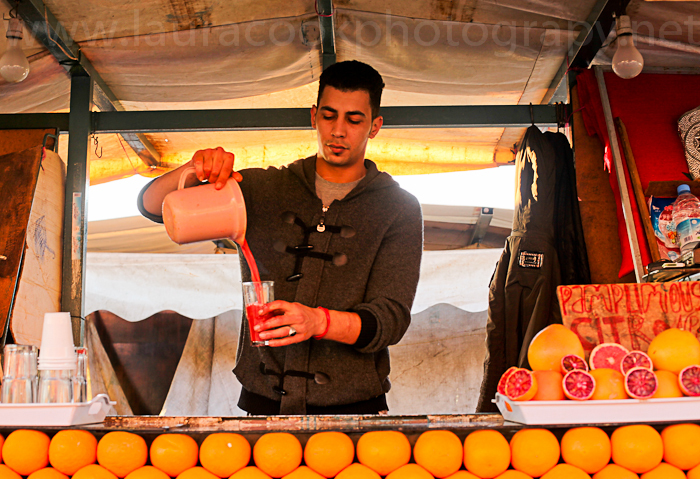 Jamaa el Fna is full of orange juice sellers at night. 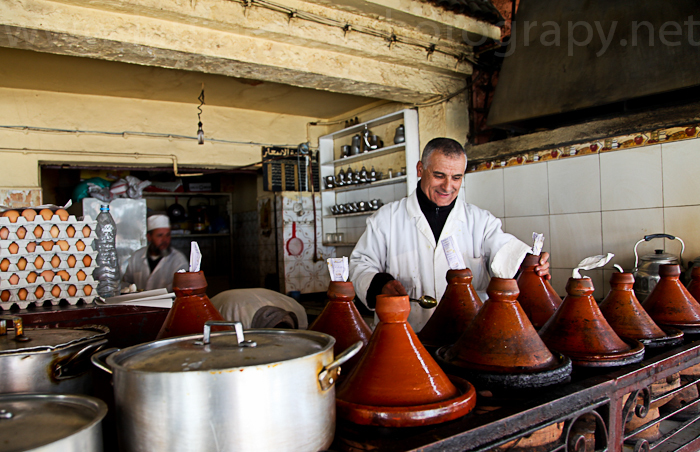 Tagine ready for sale in a mountainside town just thirty minutes outside of Marrakech. Great! The atmosphere is …my husband has gone there for several times and is always thrilled. I must join him some time! It was great – you need your wits about you but a wonderful place! Will do! Hope to be back in Morocco soon, great place. just got back from a wonderful/interesting three days. I’m very interested if you got any photos in the square without paying and weather the guys in the souks were happy for their photos to be taken. Did you eat the street food? Did you get ill? I was so warned not to try it which was disappointing being that eating is one of my favourite things. Hi! I found that the guys further back in the souks (especially those selling food to local people around the Islamic school area) were actually fine about having their photo taken without expecting, or even asking for, money. I took time to thank them and speak to them. Same went for the metal workers. On some of the stalls rather than give them money I bought something and then asked for a photo (e.g. hat seller). The people in the square were much more pushy though and making money off people with a camera was the norm! I never normally pay for images but in this case did give a couple of the guys money. That said – these photos were not great and so did not use them!! We did eat the street food from the centre of the square and it was really nice. We were told that the food in the heart of the square is actually tested regularly. We love eating too! I have also often found on my travels that food poisoning comes when you least expect it and both times I have been really sick from food it has been served in a nice hotel. Glad you had a good trip there – we would like to go back one day. I agree about the hotel poisoning scenario. Unfortunately I was travelling with two risk adverse friends but good to hear about the testing. We went up into the Atlas as well – got some nice pics and want to go back to the coast. Glad to find your post and congrats on being featured. Thanks. We only did a day into the Atlas and would have like loved to have done more.